Mike Peraza Signed and Numbered Giclée on Paper : "Mother's Lullaby"
About The Artist: When one looks at Mike Peraza´s impressive career, it is common to wonder how he had the time to work on so many film projects. From his early days creating layouts, to working as the Art Director for Disney´s The Little Mermaid, Mr. Peraza´s amazing talents have shaped the animation world, and helped to usher in the fabled Disney Renaissance. One of his first assignments at Disney was to help in designing the multiplane shots for The Fox and The Hound. This project was only the first in an impressive list of animated features that Mr. Peraza had a hand in shaping. This list includes projects such as Dragon´s Lair, Space Ace, The Great Mouse Detective, TRON, Something Wicked this way Comes, Return to OZ, Ducktales, Chip and Dale - Rescue Rangers, Talespin, Goof Troop, Who Framed Roger Rabbit, Aladdin, Beauty and the Beast, Thumbelina, Stuart Little and Fox´s, Anastasia and Ice Age. One of Mr. Peraza´s favorite memories came when, at the wrap party for The Great Mouse Detective, John Musker and Ron Clements brought over The Little Mermaid script and asked if he would be interested in Art Directing it. As a big fan of Mr. Muscker and Mr. Clements, Peraza didn´t have to think long before taking the position. When The Little Mermaid premiered, it was given credit for breathing life back into the animated feature film genre and also marked the beginning of the era known as the Disney Renaissance. 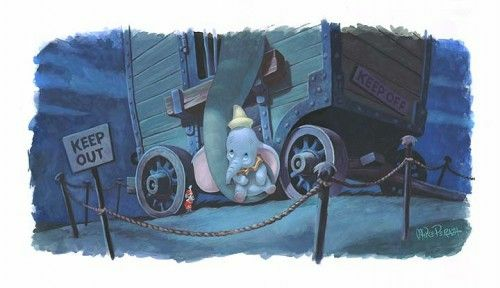 Collectors Editions is thrilled to have Mike Peraza as a member of the Disney Fine Art Family, and is confident that his consummate professionalism, groundbreaking talent and love for all things Disney, will ensure that his works are well received by all who look upon them.